Beer enthusiast and Antic pub landlord Richard Salthouse caught up with Head Brewer, Stephen Lawson, to talk about all things Volden. Richard Salthouse: What is your background? How did you start brewing? Stephen Lawson: I started brewing beer when I was a student. I have always been interested in beer, food and its provenance, and this led me to trying to make it myself. At home I started with kits, which then led on to extracts and whole hops. I then went onto full mash brewing. In 1990, I got a job with Firkin Brewery and worked there until their dissolution ten years later. At that point it was about 2000 and there was virtually nothing going on in London for small-scale microbrewers. I worked for Pitfield for a short while, but with a young family to support, I ended up leaving the industry and for the next ten years I pursued other things. RS: How did you meet Antic? RS: How did Volden come about? SL: We had a site in Camberwell which we worked on for a few years. We were experiencing some issues with the premises when we got a whisper about a working brewery based down in Croydon may be available. The current owners of Clarence & Fredricks did not want to continue. The brewery was half the size of our original site but it meant that we could start making beer. We moved in around early March and began producing in April and we’ve being doing so ever since. RS: Where does the name Volden come from? SL: Anthony (Founder of Antic London) liked the logo design of an old truck company called Vulcan so he looked for a name with a similar number of letters that he could arrange around the distinctive ‘V’ and came up with Volden. RS: What do you brew? SL: The first thing we were asked to brew was a great session bitter. So we came up with a 3.8%ABV Session Ale which is accessible, very moreish and has a lot of depth of flavour. It is sold at a competitive price of £3.30. The idea behind the beer is to deliver a session ale that it accessible to people but is still interesting enough for people to keep coming back for more. RS: You briefly touched upon the ingredients that go into making the Session Ale as being prime, good quality ingredients. I personally think the best selling point of the Session Ale, is not just that we brew it ourselves but it is made with UK malts and UK hops, especially at a time when a large amount of breweries are doing the opposite and shopping all over the world for hops. How did you go about choosing the ingredients specifically? Stephen: I am very keen on the idea that if you are producing anything comestible should be about the place it’s from. What I mean by this is that the provenance of the ingredients used to make a particular product is inimitable to that product. Here at Volden I want our beers to be of where we are in the world and, more specifically, where we are in the UK. I try and source the best malt and hops that I can find closest to where we are located. Our barley comes from Norfolk where the variety Maris Otter grows. This is a very unique stretch of land and is the only place in the world where it grows. In terms of hops we use English aroma varieties and are currently working with our hop merchants to forward buy hops that have just been harvested for the next year and again we will be going to quality assess them in January to choose the best. RS: You mentioned that the Session Ale is available at £3.30 a pint. With the average price of a beer in London being much more than this, what is the idea behind the price? RS: You recently brewed a wild hop beer in mid-September. How did come about? Stephen: Having previously worked for the previous brewery, our part-time brewer Michaela knew where they grow. You will be surprised to learn that wild hops can be found in the hedgerows and off cuts of land around the brewery. Having located the hops, a team of our pubs’ staff helped pick 8kg worth and the next day we brewed with them. RS: How does Volden fit into the group of pubs we know as Antic? SL: With over 40 pubs across London, we are currently supplying to the 30 that are free of tie. All the pubs are at liberty to buy beer wherever they want within operating procedures so our beer stands on the bar amongst a forest of our competitors. This is very unusual for a brewery that has pubs of its own to be outnumbered by its competitors on its bars. I don’t believe you will find this anywhere else in the country. RS: So Antic is not a brewery company with pubs, it’s a pub company with a brewery? SL: Exactly. I don’t know if this is always going to be as such. I guess it will depend on the success of what we’re doing here. RS: Can people buy Volden beer outside Antic pubs? SL: We pride ourselves on supplying exclusively to Antic pubs, however we have recently supplied to a few one-off events so it’s always worth getting in touch. 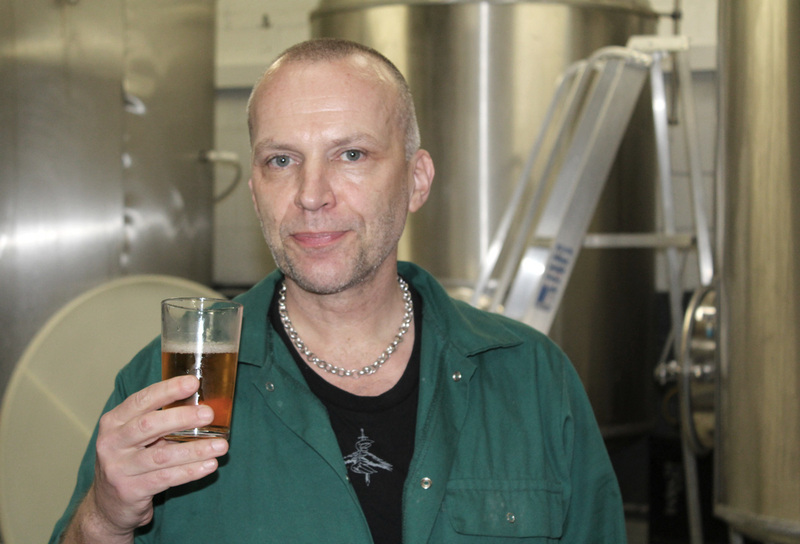 RS: How important is the role of the pub landlord in you beer? SL: Without the goodwill, professionalism and attention to detail of everyone who works in the pubs, we would not be able to deliver the product that we intend to. Therefore the role of the pub landlord, assistant, right down to the regular bar staff, is very important to us. It is vital that the person behind the bar is checking to see if the glass is clean, that it’s not chipped, and to see if the pint needs topping up. Customers appreciate these small details. Therefore it is important for the pubs to ensure standards are kept high so that our drinkers are kept happy. RS: And lastly, what do you think about the craft beer revolution? SL: I think it’s brilliant. There is a real appetite for knowledge, where so many people are getting involved and opening breweries. My experience of the beer industry growing up was of everything getting smaller and us having to defend what we have got left. Brewing was an ever-diminishing resource and then suddenly it has gone the other way. There are loads of young people engaged in it and there are a lot of new styles and flavours coming out. It’s amazing and one of the best things that have happened in brewing since I can remember.